Here at DeckStainHelp.com we take pride in the fact that we have become the Internet’s go-to site for all things exterior wood and deck restoration related. Hearing from our customers who have used TWP 1500 stain in the past, their decks have held up to the test of time and weather after this harsh winter. It is also one of our top go-to stains for our restoration business. As always, we appreciate your input, so feel free to leave a comment below and pictures of your completed projects if you have them. Important Note: This is our 2nd Review of TWP 1500 Series. Our first review of the TWP 1500 Stain was started in 2010 and completed in 2012. 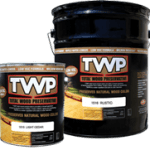 TWP 1500 Series Preservative is an Oil-Based EPA approved wood enhancing preservative that stops structural damage and exterior wood rot on treated or previously treated above ground wood surfaces such as fencing, decking, roof shakes, wood siding and log homes. 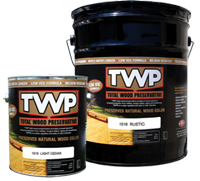 *Note: TWP 1500 and the TWP 100 are the only deck stains registered by the EPA as a wood preservative. The 1500 is compliant in all US states while the 100 Series is not. For the pine deck, we used the TWP 1530 Natural. This is not a “clear” but rather a traditional cedar color in our opinion. The manufacturer stated they made this color in the 1500 Series to match the color of the TWP 101 Cedartone. This allows for an easy switch from the 100 Series for consumers who are in a low VOC state. The wood grain was highlighted naturally with the 1530 Natural semi-transparent tint. The 1500 does not mask or film on top of the wood grain. Excellent at preventing UV graying at the two-year mark. For the vertical railings, the TWP 1500 lost very little of the color. For the horizontals, we saw close to 80% color retention. The TWP 1500 penetrates deep into the wood reducing the chance of wearing. We find that the 1500 Scored well here for a low VOC oil based stain. Note that when staining brand new wood with TWP, we have found that it is best to let the wood season in the elements for at least 3+ months. Once it is weathered, we prep with a deck cleaner and wood brightener to enhance the stain penetration. Only 1 coat of the TWP 1500 for new smooth wood. We find that the TWP 1500 Series Stain to be the best performing oil-based deck stain on the market. The zinc oxide nano-particles do double duty in preventing UV fading and preventing mold or mildew growth. We personally use the TWP 1500 Series Stain on deck restorations every year in the Midwest and is one of our go-to brands. TWP 1500 Series was introduced in the Summer of 2010 as the replacement for the TWP 500 Series. TWP 1500 stain is a semi-transparent oil based wood preservative registered by the EPA. The only deck preservative that is currently registered as an exterior wood preservative. TWP 1500 Series is designed for all exterior unfinished wood. It has excellent UV resistance from graying. It is mostly used for exterior wood decking, wood fencing, log homes, cedar sided homes, etc. TWP 1500 comes in 10 colors that allow the natural grain of the wood to show through. – TWP 1500 Series had a beautiful rich look to the wood. The wood grain was highlighted naturally. 1501 Cedartone color was slightly brown for a traditional cedar color. – Excellent at preventing UV graying at the two-year mark. One of the top stains that we have tested in terms of absorbing the UV radiation that causes oxidation of the wood. – Very good at preventing peeling. TWP penetrates deep into the wood. This seems to reduce any chance of wearing or peeling at the surface.